Kids will love these cute Easter baskets which are ideal for egg hunts and egg deliveries and Easter parties. 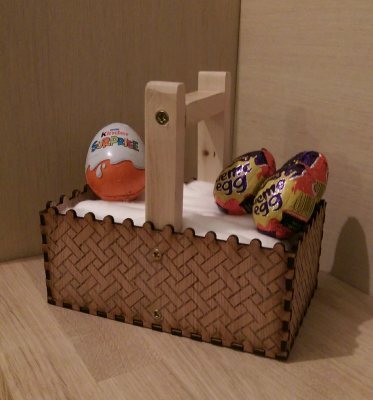 Made from laser cut 3mm ply with engraved basket weave design and solid wood handle. 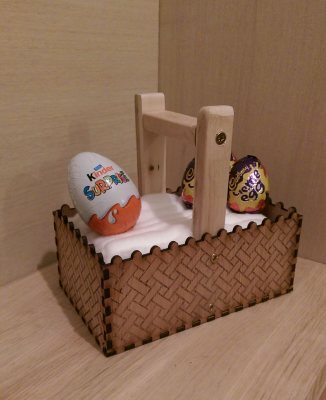 These personalised egg holders hold a standard Kinder egg perfectly. 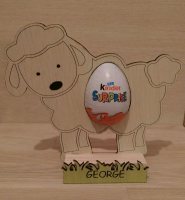 Personalised with your child's name and hand painted, they are great for gifts or multiples make a great Easter egg hunt. Chicks and Bunnies measures 18 cm high and Lambs are 15 cm high. 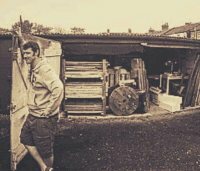 All are 8 cm wide and cut from 3mm ply with a solid wood stand.